Weighty Matters: Does what hand you eat with affect your weight? I'm guessing many of my readers have heard of Brian Wansink's original stale popcorn experiment. Without getting into exact details, Wansink found that the amount of awful stale popcorn consumed by movie goers was dramatically influenced by the size of the container of awfully stale popcorn (I believe folks who received larger tubs ate 30% more despite ranking the popcorn as equally awful). Well check this out. Some folks out in California explored things a bit further. 1. Awful, stale popcorn at the movies. 2. Awful, stale popcorn in a meeting room. 3. 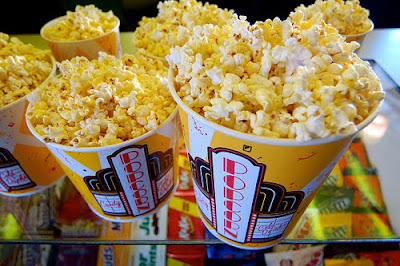 Awful, stale popcorn at the movies handled with subjects' non-dominant hands. Researchers also subdivided folks into those who were habitual movie popcorn eaters, and those who weren't. In the movie situation, habitual eaters ate just as much awful, stale stuff as they did the fresh, but not so in the meeting room, and not so when eating with their non-dominant hands! Basically if the habitual nature of the pattern was disrupted (by taking popcorn out of context or by using a hand that required conscious attention), people seemed to notice just how awful the stale popcorn really was. A fascinating result and one that lends credence to the importance of mindful eating practices, as well as to actively attacking your own automated eating patterns (like not eating in front of the TV for instance). And maybe (just maybe) it means that switching which hand you regularly eat with, especially if eating habitual and/or highly palatable foods, is an effective weight loss strategy.